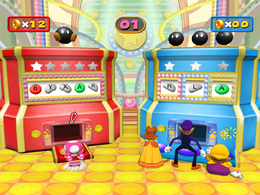 Coin-op Bop is a 1-vs-3 minigame in Mario Party 7. Each player stands in front of a slot-like machine pressing buttons to get coins. The three people on the right have to press one button per person, while the solo player on the left has to press five buttons alone. If a player presses an incorrect button, a Bob-omb will fall down and explode, costing them time. Each series of buttons earn three coins to whoever finishes the series, regardless of what team the player is on. Rules – "Stop the slot to get coins. One player presses 5 buttons, while 3 others press them as a team." Advice – "If you press the wrong button, a Bob-omb will fall on your head! Ouch!" This page was last edited on January 29, 2019, at 18:27.